The story of The Buddha from Babylon begins with one of the oldest colc case mysteries in history, the sudden death of the Persian Emperor as he heads back from Egypt to Babylon. The sudden death of the Persian Emperor in 522 BCE is one of history’s great mysteries. Was his demise self-inflicted, accidental, an assassination or due to natural causes? The author contends that during this incident Siddhartha Gautama may have been the leader of Babylon's Magi, an interfaith order that assumed governance of the region. The situation explodes when Darius the Great seizes the throne. Simultaneously the Magi Order is purged as Siddhartha, prince of the Saka nation, heads back east to the Indus. The Buddha from Babylon: The Lost History and Cosmic Vision of Siddhartha Gautama uncovers new evidence that solves this ages-old mystery and uncovers Babylonian influences in the Buddha's revelations. Darius the Great stabbing a lion in the head echoes his coming to power by overthrowing a Lion-Sun "seer-stargazer" named Gaumata. The Buddha from Babylon's literary style mirrors the mythological styling of ancient spiritual literature. It is a narrative built on a rich load of research evidence, archaeological, linguistic, and scriptural. While it is primarily a work of non-fiction, it also makes use of historical dramatization and interpretation to deepen the reader's experience. As Joseph Campbell explained, across the world we find mythic stories of "the hero journey." Invariably, it's a journey of transformation through three phases: separation (from home), maturity (acquired through facing challenges), and return (becoming wise based on experience). While the Buddha's journey is that of a hero, it also transcendent. It epitomizes the term "neti neti (neither this, nor that)," the key for gaining access into the paradoxical Buddhistgateway of the Middle Path. From that perspective, itself a reflection of Buddhist literature where meaning trumps fact, this book is neither strictly non-fiction nor historical fiction. It contains both aspects to some degree, integrating historical clues and derivative speculation for the sake of telling Universal Truth. In some respect, the writing blurs the strict dividing line of publishing's categorization in modern times. The wide range and large scope of its subject matter required of this book to be a vessel of enlightened wisdom and a catalyst for readers seeking to transform their lives. This effort provides a complete arc of the Buddha's journey and a unified scope of his Enlightenment. It reveals him to be the proto-modern man, the first psychologist-cosmologist-philosopher-theologian. He represents the pinnacle wisdom of ancient spirituality that only now can we begin to more fully appreciate. The author intends to inspire respect for the Buddha's advanced visionary sight, trigger conversations about our consciousness going into the future, and encourage people to fulfill their greatest personal potentials. Today's major religious institutions—Christianity, Islam, Buddhism, Hinduism, and Judaism—share the common view that their theologies were formed in isolation by their founders. But, in actuality, some of their notions regarding deities, spirits, souls, and the afterlife appear in earlier religions of shamanic, Egyptian and Mesopotamian origins. The traditional biography of the Buddha claims that from birth he resided in today's India and Nepal. He is lauded by Buddhists for his awakening to Ultimate Truth, known as his enlightenment. His teachings describe how human beings can follow in his footsteps and turn suffering into freedom and joy. This book explores the view that the foundation for his wisdom lies in mythic visions expressed by prior seers. The author finds evidence that links the Buddha to the Magi Order of Babylon, whose aspiration focused on figuring out the Truth of the Realty of All Existence — a cosmic theory of everything they had hoped would be acceptable to all religions. This complete biography of the Buddha's journey of enlightenment offers this shocking revelation: Prior to achieving his boundless awakening the Buddha had been a philosopher and seer in Babylon. Well versed in the mythic language of cosmic symbolism, as expressed from shamanic times through the earliest religious cultures, he was an expert educated on Mesopotamian, Egyptian, Judean, Vedic, Brahmanic and Persian theologies. Sumer/Akkad, Egypt, Babylonia, India, Medes, Elam/Persia, Judea/Israel, Assyria, and Greece. Buddha and his Buddhist followers; shamans, seers, prophets and Magi; various kings from Egypt to Persia, includng Darius the Great and other Achaemenid rulers; and the wisdom teachers of Vedism, Jainism, Brahamism, Judaism, and Zoroasterianism. Buddhism proposes that all of existence is a dynamic super-system that is boundless, ever-changing and purposeful. Its teachings, called the Buddha-Dharma, were initiated by its founder, Siddhartha Gautama (565 - 485 BCE). Some 2,500 years ago, he was the legendary prince who became the Buddha. This book proposes that he had been the royal scion of the Saka-Scythians, followers of the Arya (Lion-Sun seers) tradition. 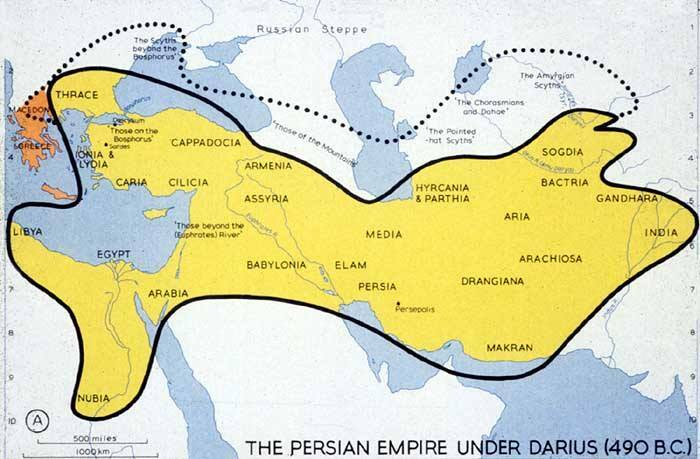 In the 6th C. BCE they were settled in an area that today ranges from Iran to Afghanistan. After his lifetime various cultures from India to China and Southeast Asia embraced and adapted Buddhism. It developed a diaspora of believers, a host of self-transformation practices, and multiple ecclesiastic scenarios. As a tree trunk is to its branches, Buddhism's varieties all rely on the Sage of the Saka, known as Sakamuni, as the source of the Teachings. But his personal story may have been lost in the folds of history, hidden til now! Coming out of Babylon, the Buddha provided an enlightened view of humanity's struggle — we are on a grand journey of transformation unconsciously in pursuit of higher consciousness! Known today through the survival of scriptures written in mythic language, his sutras reveal the cosmic scope of Existence and shed light on practices the ancients used for scaling to higher levels of transcendent wisdom. The Buddha proposed that people, Nature (shared environment), and all of Existence were integrated in a symbiotic, yet transient dance of life...on a "dance floor" that exceeded the parameters of birth and death, space, time, scale or dimension. Perhaps because the Buddha's spoken words and visions were compiled into written form many years after his passing, the bulk of academic analysis of his cosmic views suggests that the sutras were created in a later era. In other words, they are saying that the Buddha did not personally craft these views. By tying the cosmic visions of the sutras back to him in 6th C. BCE Babylon, this book builds a well-researched case for the view that he actually was personally responsible for the Teachings of Cosmic Buddhism.